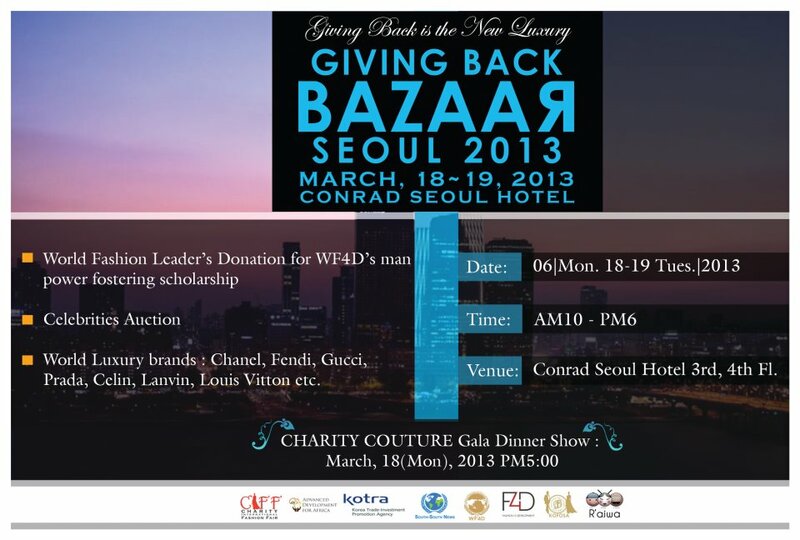 From March 18th – 19th 2013, World Fashion for Development (WF4D) will host its annual “Giving Back Bazaar” at the Conrad Hotel in Seoul, South Korea. The Bazaar is a two-day fashion fundraiser showcase featuring individuals, corporations and organizations in the fashion industry who are currently working towards economic development in Africa. World Fashion 4 Development (WF4D) has revealed the impressive lineup of African designers slated to showcase their imaginative and unique collections during its Giving Back Bazaar. True to WF4D’s focus on Africa, these featured designers either hail from or are inspired by the style and culture of a wide range of African nations including Ghana, Kenya, Nigeria and South Africa. These designers will either take part in the bazaar or the Charity Couture Gala Dinner Show event on Monday, March 18th 2013 at 5:00pm. Other Designers to showcase will be include luxury brands such as Chanel, Givenchy and Louis Vuitton in addition to World Fashion Grand Prize honorees whose work in promoting development through fashion are in support of the UN’s Millennium Development Goals. WF4D works to support the UN Millennium Development Goals of ending poverty, promoting economic development, humanitarian cooperation, environmental awareness and social responsibility by using fashion as an avenue for global development. As part of its efforts, WF4D raises money for a scholarship that serves to educate and train individuals enabling them to harness the power of fashion to empower their communities to build a sustainable future. WF4D has previously demonstrated its commitment to Africa with the awarding of their 2012 scholarship to Ghanaian jewelry designer, Linda Young . Profits from the Bazaar will be used towards the WF4D Scholarship.